1. TAX FILE NUMBER (TFN) – Unless you have a tax file number you cannot work on the Farm. 1. Every person working in Australia must have a Tax File Number. 2. Your TFN allows the government to keep a record of your earning and taxes paid during your time in Australia. 3. You tax file number will be given to you by the Australian Tax Office. 4. You MUST use your TFN when filling out your tax application form. 5. You MUST declare all income earned on the tax form (It is illegal to not fill in a tax form). 1. Summer season starts in October and finishes in December. 2. Winter season starts in April and finishes in September. • We pack Gourmet tomatoes, Snow peas, Capsicum and Sweet Potato according to their seasons. 1. 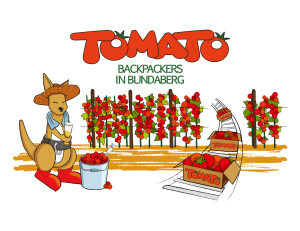 We pack tomatoes all year round. 2. There is always work to be done (depending on farm orders and good money can be made during heavy work periods). 1. Cherry and grape tomatoes : Packed all year round. 2. Gourmet Tomato, Snow peas, Sweet Potato and Capsicum : Packed Seasonally. 1. Field work includes : planting, trimming, bucket setting and placing plastic stakes. 1. SWEET POTATO WORK – $21.61 per hour (including 13% tax) per hour – this is paid weekly by the farm owner. 1. Sweet potato work includes: planting, digging, cutting and packing. 1. We CAN NOT guaranty work every day because farm work always depends on the weather and work ordered by the farms. 2. Workers usually are picked up around 5am from the gate in front of the accommodation buildings. • Work usually starts around 5.30am (Summer starting time can be earlier. Winter starting time can be later). 1. Work hours finish when the day’s work is completed. 1. PROTECTION: You MUST bring drinking water(Ice water), a lunch box and sunscreen lotion with you each day. 2. SHED WORK: While in the packing shed plastic gloves, running shoes and a farm safety T-SHIRT must be worn. • FIELD WORK: While working in the field, a Hat and working gloves must be worn. 1. FARM SAFETY T-SHIRT: You MUST wear a farm safety T-Shirt at all times in the shed. YOU can buy your Farm Safety T-Shirt from the Backpackers’ Manager. 2. FOOD & DRINKS: Korean Food and drinks are available for purchase from the vending machine on the ground floor of building #2. 2. Wages are calculated at an hourly rate according to the type of work done (See items 2.A and 2.B). 3. Wages are calculated from Monday to Sunday each week commencing every second week. 4. If you start work after the pay period has commenced, your first wage is paid on the second Monday after you start work. The balance of your wages earned is always paid with your last payment. 5. Wages are normally paid every second Monday. 4. BSB NO. AND ACCOUNT NO. 1. Please note that the number on the front of your credit card is NOT your bank account number. 2. Your bank details (BSB – ACCOUNT number) will have been given to you by the bank when you opened your account. 3. The BSB number identifies the Bank, State and Branch where you opened your bank account. 5. Your ACCOUNT number identifies your bank details. Some banks have 6 digits, some have 8 digits and some have 10 digits. 6. The ACCOUNT HOLDER NAME identified who you are. It should be your name EXACTLY as it appears on your passport. 7. YOU MUST DOUBLE CHECK ALL THE BSB AND ACCOUNT NUMBERS EVERY TIME YOU WRITE THEM. 8. REMEMBER: If you write even one wrong number, you will not receive your pay. Your wages will be sent to the wrong account. 4. Tax amount (The amount of tax paid during the two weeks). 6. PAYMENT SUMMARY (Total of all wages earned) – You do need this for TAX returns. 1. This payment summary will be given to you 2 weeks after the END of your employment. 1. Your rent fee is $180 per week. This includes your transport(pick-up), WIFI and electricity (not washing machine charges). 1. The security deposit is $200. 3. Your security deposit ($200) will be sent as a refund to your bank account after you check out. •If you lose your key. 1. You MUST give 2 weeks advanced notice in writing of your intention to leave the farm. 2. This written notice must be given to the Backpackers manager WHO will sign and date it. 1. The schedule for each day’s work will be available from 9pm the evening before. 2. You MUST check your work schedule every night. 1. If you cannot work tomorrow, you MUST let the Backpackers’ manager know by 6pm tonight (SMS is easiest and best way). 2. If you do not SMS the manager about your day-off, you will be expected to work tomorrow. 3. If you do not receive a confirmation about your day off, SMS again. • Exact date for when you started work on the farm and the exact date that you finished working on the farm. 1. To get your second visa, your Australian bank statement must show you have enough money to stay in Australia. 1. Purchase something with your bank card at least 3 times a week (all purchases are recorded on your bank statement). 1. Keep all bus and train tickets as proof of your travel in Australia (Show these tickets with your Visa application). Note #1: Do not send original forms with your application unless asked. Make copies of all documents and send copies only. Note #3: If you do not get a reply within one month, contact the Visa office (Phone Number: 131881). 1. You must apply for your 1263 form at least 3 days before you will leave the farm.